< Time to replace the gloom with a big lift! 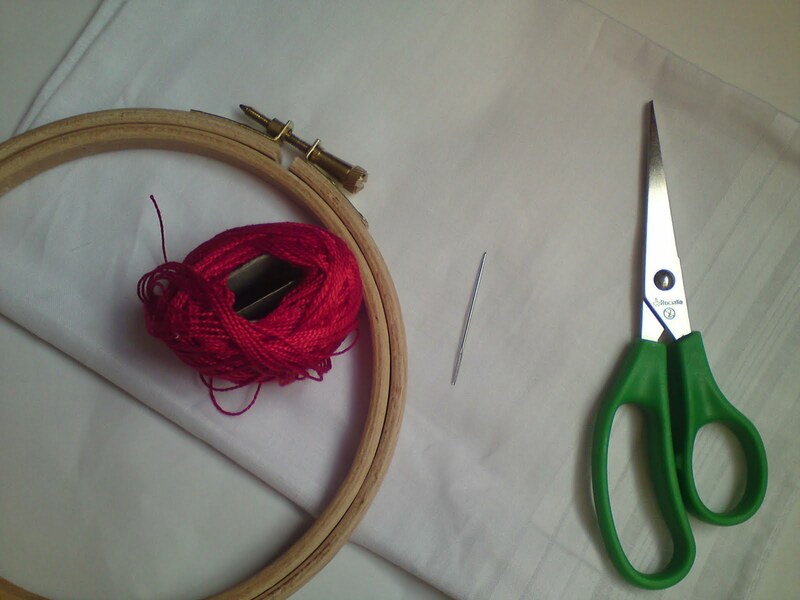 I have recently been experimenting with various kinds of embroidery from various parts of the world. So for the tutorial today I thought I would introduce you to Kamal Kadai which originated in India. We will be making an embroidered hankerchief. First you need to decide on your design. Try it out on paper first. 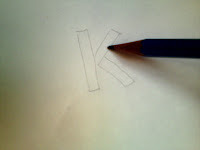 Kamal Kadai works using lines, so bubble style writing would be rather hard, keep it angular and straight. Place your hankerchief into the embroidery hoop. Using the pencil lightly draw your design onto the fabric. 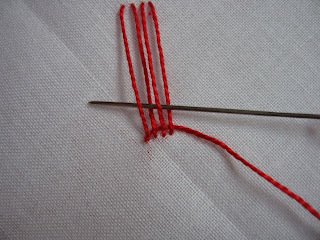 Now we need to stitch the design on using long vertical stitch lines. The fun part! Bring your needle up at a corner and weave up and down horizontally through the vertical lines. 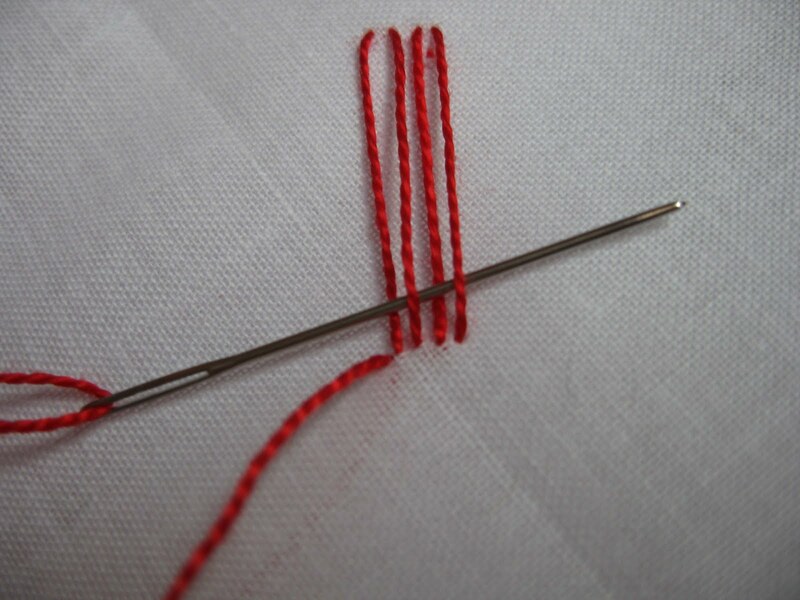 Turn the needle round and weave the opposite way. Keep going using this technique until you have filled that section of vertical lines. Then start on the next section according to your design. 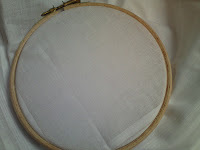 Make sure to keep the horizonal weave lines close together and ta da you’ve embroidered your hanky! 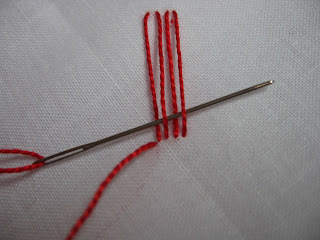 If your design is hanging too far away from the fabric just put a few tiny stitches in to hold it down. The small cross at the bottom of the hanky was created using another embroidery technique, if people would like I can teach this in another tutorial in the future? This entry was posted in Tutorials and tagged ambroidery, hankerchief, indian, kamal kadai, tutorial. Bookmark the permalink. Thanks heaps for this fab post. 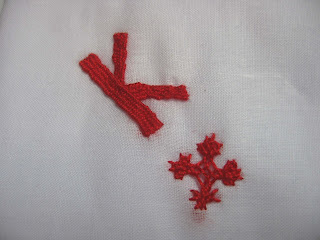 :o)) I can't wait to try this embriodery style, please can you post more?! Wow, you make that look so easy! It turned out awesome! Returning the follow from Welcome Wednesday. Thank you for stopping by and I look forward to reading more from you soon. Hi, Love the tutorial! Following back from the blog hop! Thanks for stopping by! Following back! Looking forward to getting to know you! i like this tutorial …….Great information you share with us……i like it….